The remaining three TMNT battle T.K.O., but her super powers enable the villain to retrieve the final piece of the artifact – that is until Splinter arrives and knocks her out via a nerve pinch. The Sensei picks up Mike and states that to save him, they will have to find Shredder and complete the talisman in order to use its power to mutate Mike back to normal. Don explains that the millennial alignment creates a powerful gravitational force that is focused on one spot on earth, and the forces created can be harnessed by the Talisman of the Thirteenth House. He also surmises that the artifact is not made of jade, but of a crystalized form of Mutagen (which would explain its effect on Splinter and Mike). Just then, a homing device on the unconscious form of Psonic begins beeping. Don figures out what it is, and tries to crack its code to allow the Turtles to be beamed to Shredder’s headquarters. However, Cyberius is well aware of the Don’s tampering and asks Shredder if he should beam them into outer space or allow them to arrive at the spot of the millennial alignment. Since the Turtles hold the final piece of the talisman, Shredder tells his henchman to beam them to the spot they’re at – and Cyberius does so. 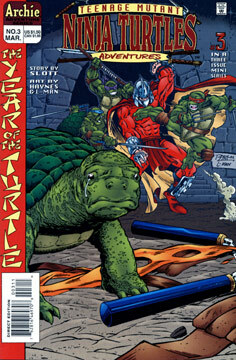 The Turtles and Splinter arrive where Shredder has defeated the army. Shredder easily defeats the Turtles thanks to the power of the two talisman pieces that he holds. Splinter walks up to his arch enemy and stands still, offering no resistance “for the good of the world”. Shredder delivers a killing blow, but before it strike shome, he realizes what Yoshi was attempting to do. Splinter had the final piece of the talisman under his shirt, and he hoped that Shredder would destroy it with is powerful unch – however, the villain stops his assault in time and instead grabs the last section of the artifact and pieces it together. Shredder surges with cosmic power and prepares to shape the world to his whim. As he begins to walk, he trips on Mike and drops the talisman onto the small turtle. Mike uses the talisman’s power to create a piece of pizza to munch on. Shredder becomes a catatonic mess when he realizes that all his efforts were wasted and that the infinite millennial power was used to make a single slice of pizza. Donatello takes out Cyberius. Splinter picks up the Talisman and he and the three turtles use what powers are left in it to try to save Mike. Back in the boy’s bedroom, we see that the child that Splinter has been telling the story to is none other than Michaelangelo, who has reverted back to his mutated self. After Splinter says goodnight to Mikey and leaves the room, the others ask if their brother will be okay. The Sensei assures them that he will be fine. When Don asks his master how he can be so sure, Splinter reveals that the effect of the talisman is wearing off on himself – he is growing long fur on his arm and reverting back to his own mutated form. When Don expresses his sympathy, Splinter states that it is not time for regrets, but time to celebrate the Turtles for making the world a better place.